A big thank you to everyone who participated in our Coal Ash Asia 2018 proceedings in Shuozhou City, China, this past September 12-15th. This year's topics focused on the high-value utilization of fly ash, FGD gypsum and coal gangue as well as highlight applications in building material products (cement, concrete, geopolymers etc). We would like to extend our humble gratitude to our friends at the China Building Materials Academy’s Institute of Technical Information for the Building Materials Industry, in Beijing. This year’s extension and construction of our annual products and services exhibition was our largest in Coal Ash Asia history, with over 50 exhibitors, and a welcome ceremony which included an orchestra playing on instruments made primarily from fly ash! New to this year’s proceedings was our Technology Symposium track geared towards new technologies in fly ash, which included discussion on fly ash based aggregates, fillers, and ceramic tiles. Contributors to this track included: Prof. Chang Jiqing from Guangdong Penghu Industrial Co., Ltd., Zhang Jingjie from Shanxi Hujin Coal Electricity New Material Co., Ltd., Ma Liantao from Hengyuan Waste Utilization, and Peter Ma from Shandong Wei Tong Technology Co., Ltd.
Another new feature was our meeting dedicated to new FGD gypsum technologies. Content included alpha high strength gypsum and calcination methods. Contributors included: Prof. Duan Pengxuan from Guilin University of Technology, Prof. Xiang Lan from Tsinghua University, and Li Yushan from Shandong Pingyi Kaiyuan New Building Material Co., Ltd. This year also welcomes esteemed contributor, Mr. Bill Martin, who led engaged attendees in his workshop, “Fly Ash Use in Road and Embankment Construction”. 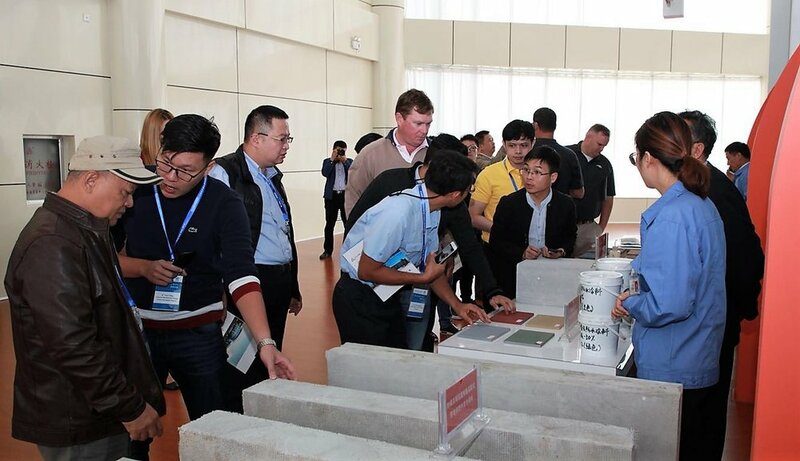 Here, Mr. Martin led the discussion for industry experts, who explained real-world projects of American and Australian fly-ash in road projects. Also discussed were new technology and applications in road engineering. Attendees were able to openly discuss and compare methods and approaches to road construction, and receive technical explanations as to the process of applying road and embankment technology from start to finish. We are excited to announce upcoming events and association/research developments in the new year. Please sign up for our newsletter to stay in touch! Thank you, we look forward to sending you meaningful updates and engagement opportunities. Here are a few pictures from CAA2018! An Album will be available under past events, in the coming weeks. Want to Download the Conference program from CAA2018? You can find it on our CAA introduction page.